Okay the Horned-ones are coming to a close and I will have the army pictures up shortly. What army do you want to see next? D E V O U T ! I say go for Devout as well, but then I may be a little biased. I have looked over the figures and as we all know their are three parts to the devout. Men, demons and undead. I have to build a couple of figures for each group. Men I have to finish my blood hunters. 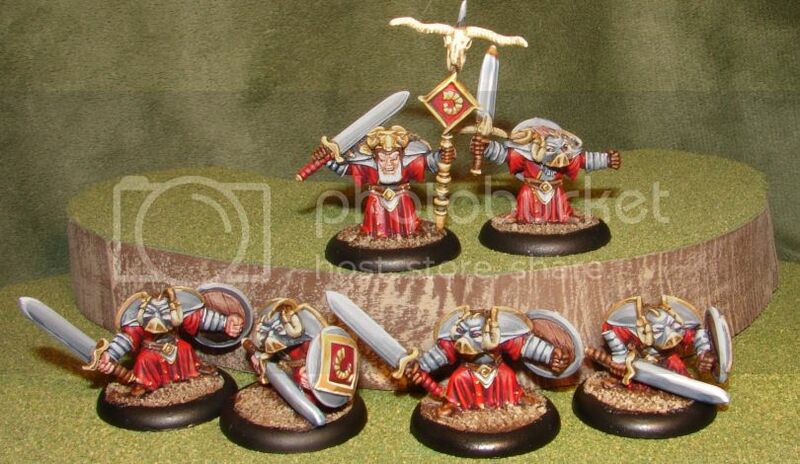 Demons I want some of the new cauldron born minis to fill the role of dusk realm demons. The undead I have all the troops but I am converting some elven archers. This normally would not be an issue but I will be doing some traveling in the next two weeks. So I am going to do the crystal lotus, I want to do the obsidian serpents but we need a break from black and red. I do have a question for any of you. 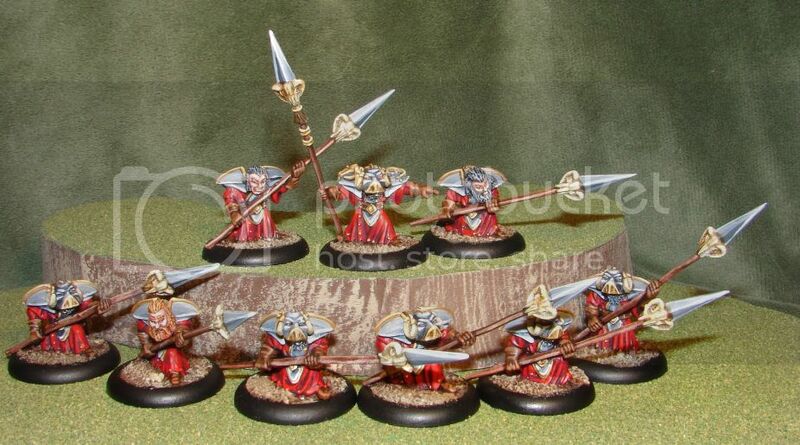 I have always hated the spear tips on the elves. Does anyone know of some good replacement ones? I know I can buy gw spears on eBay and cut the tips and I will but I have been surprised I have not seen any prefabricated ones in resin. Any help? I don't know about the GW spears, but couldn't you just look up a historical range. Probably a lot cheaper. Something like tbis. 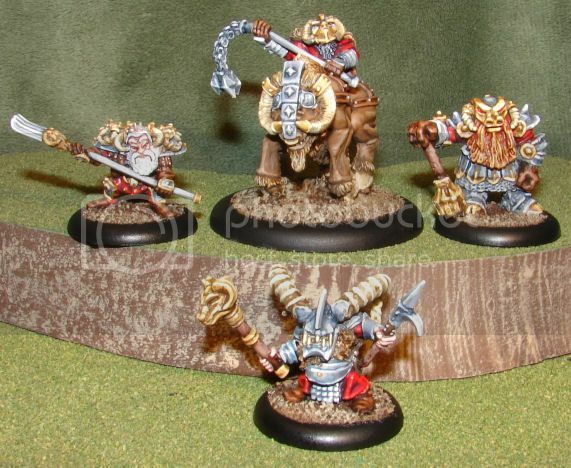 With the cauldron born minis, I have seen their Facebook page but do you know if they have an online shop? Or do you just email them to try to order? :oWonderful. 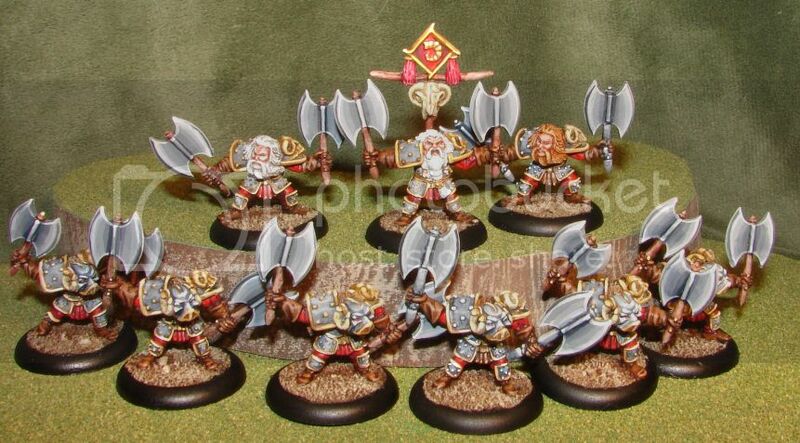 You've made me want to use Dwarfs . I have two of each Totem, I have been saving them for last. I got lucky hunting for the Horned ones and I found both heads. So the Totems are coming for all the clans. Excellent work. I really like them and I appreciate the choice of keeping the original colour scheme. I know you already told it somewhere else on the forum, but can you please re-link the site where to buy the proxy champion with the mace? I find it really cool and the size is perfect. Best in the world. Stunning! I honestly don't remember. Manic posted the original figure and I looked around and I can not find it either. I will keep looking because he is a cool figure. He is a good bit larger than most 28mm figures. Just a quick update. I am going to continue to finish the Chronopia figures and keep posting. I have not given up or taken a break. So what have I been up to? Somewhere I decided I needed to be in the miniature business with all my spare time and experience which is non-existent. I am not sure who convinced me it was a good idea and would be fun (Andy) but I figured I would give it a try. I will be starting a new thread today called CtoW. I am not going to reveal too much here but come and see me and see what I have been up too.